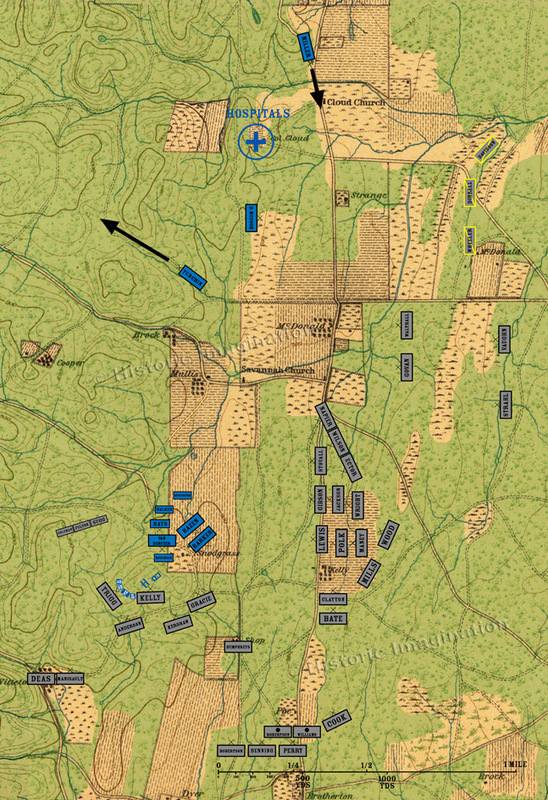 Trigg’s and Kelly’s Brigades move up the slopes of Hill Three, walk up to the 21st Ohio, 89th Ohio, and 22nd Michigan in the darkness, and capture them. North of Savannah Church, Turchin’s brigade forms up and marches toward McFarland Gap. Forces led by General Sheridan arrive near Cloud Church after marching from McFarland Gap via Rossville. There is some dispute about how many men Sheridan had with him. Sheridan himself maintains his entire division. However, only the after action reports of Colonel Silas Miller and a regiment in his brigade mention the march to the church. Reports from the other two brigades state only that they marched to Rossville and camped for the night. The most probable scenario is that Sheridan marched his division to Rossville, continued on with Miller’s single brigade, and then embellished his report and subsequent writings. He may have done so to fend off criticism for his choice to march to Rossville and then down the Lafayette Road toward helping Thomas instead of the direct route along the Dry Valley Road.